With all the hurricanes visiting the U.S., it’s no surprise that condominiums are being hit hard. Compared to an HOA, COAs serve communities that tend to have a high population density and lots of shared space and common elements. And, just by the nature of condo architecture, properties are often impacted as a whole rather than just individual units. There’s a lot to deal with—both in preparing for a natural disaster and handling the aftermath. Here are some things to consider that may help your COA and residents weather a devastating event. Communication is the key to good preparedness for any condo association. Begin by developing a disaster readiness plan for your COA and your community based on the types of natural disasters that are most likely to occur in your area. FEMA has plenty of free resources to use as a starting point, and you can add preparedness steps that are unique to your community. Steps for shutting down or unplugging equipment, locking down elevators, and making sure all access control is disabled so residents are able to enter or exit at will. Backing up all data records to the cloud and moving hard copies to off-site storage. Paying all bills so nothing falls through the cracks in the aftermath of a disaster. Outlining who is responsible for decisions. And, ensuring all appropriate board members have access to funds to pay for emergency repair efforts (such as getting flood water out of the units as fast as possible). Ensuring all disabled residents have assistance with evacuation and all units are checked to ensure no one is left behind. Communicating with residents before, during, and after a disaster will help the community pull through and rebuild faster. Make sure you have current contact for all residents and at least two ways of contacting them. Set up a system for people to get in touch is very helpful as well. You could set up a portal on your COA’s web page or through social media. The Master Policy for your COA will likely provide coverage for some types of damage. However, natural disasters may be specifically excluded or require a separate writer. For example, you may purchase hurricane coverage in a separate policy. Within that policy, hurricane damage will have its own deductible based on a percentage of the insured value of the property. 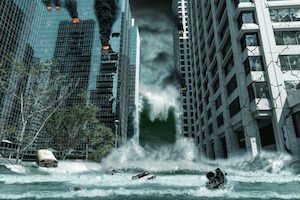 Some kinds of natural disasters like flooding and earthquakes may be much more difficult to afford. Also, you may not find a carrier that provide coverage for floods and earthquakes. In any event, if the condos could be so badly damaged they must be torn down and rebuilt, adding a demolition rider that covers tearing down the existing structure and hauling away debris also makes sense. Note: The deductibles for major damage are going to be high. If you don’t have enough funds available to pay a sizable deductible, obtain a line of credit. Preferably before the disaster happens! Residents also need to understand the coverage and limitations of the policies you have in place. Encourage your residents to out individual policies to cover their possessions. And, if your COA insurance doesn’t cover rebuilding interiors (carpeting, fixtures, etc. ), owners should carry coverage for their units in case there is a need to rebuild from scratch after a disaster. As far as filing a claim, there are a few things to keep in mind. First, you will be most successful in recouping your losses if you document the entire property before a natural disaster. Photos and videos are the best way to record the current state of the property. Second, you should always hire your own insurance adjustor rather than relying solely on the adjustor from your insurance company. Third, you should file your claim as soon as possible after the disaster. This is helpful because providers usually complete work on a first come, first serve basis. Most COAs start thinking about finding a contractor after a natural disaster is over. But it’s much smarter to vet several vendors beforehand. This way, you have time to do your research. Look into their track record. Make sure they are local. Verify their license and insurance. Dig through their online review, and then ask questions. For example, it wouldn’t hurt to know the size of the company. Or, how they go about assessing the cost of a project. How fast they can scale their workforce to handle a heavier workload? Even knowing how they prioritize repair projects after a disaster can be helpful. Armed with this information, you’ll have a much better chance of getting fair, competitive bids from reputable firms in the rush to fix everything after the disaster ends. Whatever happens, you definitely don’t want to be in the position of this Florida-based COA that signed a no-bid contract with a company that was founded just a couple of weeks before Hurricane Hermine hit. A year after the storm, their residents still had unfinished repairs. And those residents that chose to hire their own contractors just to get the work done were stuck paying a 25% surcharge to the COA’s chosen contractor for the privilege of doing so! From helping you decipher insurance policies to connecting you with qualified vendors and handling resident communication, Ardent is a trusted partner who can prepare your COA for whatever Nature throws your way. Contact us today to discuss the needs of your association.